Thanks a lot. I was looking for it. Where in CMC the report image folder setting is available in XI R2 & XI R3? or is the path always default. Hi BO User, I am not sure what you mean by “report image folder”. If you mean the location where the report files and folders are stored than this is specified on the Input File Repository Server and Output File Repository Server. In XI 3.1 the default location is \bobje\data\frsinput and \bobje\data\frsoutput, but you can change this to any path on the machine or even to a file share that is accessible from the machine. In your opinion, which is best? Hi Dawn, I always set both. For example, 32 days limit and 5 instances. Set this early, before you r users get used to something more generous and thank me later. Also, you can tweak this, depending on your security model, for different instance owners. In my system, public/corporate reports are always owned by Administrator in Production (because we use Administrator to promote them there with Import Wizard) and so I can apply different instance limits to Administrator. Thank you for your advice. Can you expand a bit on your comment, “depending on your security model, for different instance owners”. Hi Dawn, if you security model segregates your users into a small number of groups then you could apply differing instance limits to these groups. For example, all super users may be allowed 10 instances while basic users may be allowed only 5 instances. In BOXIR2 I have set the number of instances to 4 and also for the Everyone group to 4. The instances are not being removed. Is there something else I need to do? Are these limit settings hereditary? that is, will nested folders inherit this property from their parent folder? Or do I need to set this manually for every folder? Hi Ethan, the instance limits are hereditary. You should only really configure them for different user groups. These user groups will be used by the CMS when looking at an instance’s owner. Setting these for Everyone applies the setting to everyone. Hi tlampe, can you provide more information about what you are attempting to do and what steps you are taking? I have one question related to deleting instances. If the report is set to recurring & if we have a limit set to 50 for this report so this recurring instances will get deleted? & if so what will happen if we remove the limit? Will it affect the performance of the other report if we are having so many reports? Hi Pya, a recurring instance is immune to the instance limit. The Business Objects instance limit applies only to non-recurring instances. If you raise, lower, or remove the instance limit you will only impact the number of non-recurring instances that are retained. I would strongly recommend against setting this limit very high as this could kill your system. All it takes is one mistakenly scheduled refresh with a recurrence of every 1 minute to fill up the FRS storage quickly. Performance would not really be impacted too much, unless your database is poorly handling indexing and your hard disks become very fragmented. Hi Sahil, Normally a reduction in the limit should result in a reduction of existing instances within 24 hours after the change. I suggest you check back after 24 hours and confirm that your limit was properly set and application to “Everyone”. I am not able to run more then 8 servers in a node/SIA. I have created two different nodes/SIA’s with all default servers in them. Now when I run both SIA simultaneously then some servers of one of the SIA do not start. now when I stop 1 SIA then I am able to run all the servers in the running SIA. I even tried making a SIA with only CMS in it and then tried adding servers manually but after i was done adding 8 Servers in running state, 9th onwards all the servers that I added failed. I stoped one of the running server and tried starting a failed server and it started successfully. Can any one tell me what could be the reason behind this..? Hi Ranjan, I have not heard of this before. My initial thought is that it must be a limit in the resources of your system; however, I have run SIA (3.1 and 4.0) on some very under-powered virtual servers (1 CPU and 2 GB of RAM) and never had a problem running at least 16 servers in a SIA. Can you validate that you are running these on a server having at least 2 GB of RAM? Hi Julian your final words are absolutly true.and as a devoloper I found this article saved my time. Hi Julian, do you know what items I would serach on to find folders that did not have an instance limit set? We have set many to 100 but some are not set yet. I’d like to find the ones we have not set. I am facing a really strange issue here. There is a report which has about 10 schedules. The problem is that suddenly all the successful instances have stopped to appear when you view the history for the report. The recurring instances are still there but some(not all) of the successful instances are just not appearing as if they were deleted from there. I ran the schedules manually by using the Run Now option for each schedule for about 10 of the schedules. However, now only 5 of them are visible. I’m sorry if I’m posting this in the wrong place but I’m desperately looking for some explanation to this as the users are begining to ask questions about where their instances are..
Hi Ashish, this is the perfect place to ask your question. I wonder what your system’s current instance limit settings are. Could they be set to zero? Hmm… even if they were, I think the limit would not be applied immediately (perhaps this depends on the version). Another idea, are you sure that your drive holding your output FRS is not full? Please share some inputs. There has to be a logical Business Objects answer. Julian, we are on BO XI 3.1 SP3 FP3.6. The FRS is hosted on a NAS and has more than adequate space. Additionally, the limit set at the top level folders is for 100 instances of an object. However, when checked for the folders containing the actual Webi report and the report itself, there are no limit settings. To give an idea of the schedule, the schedule is supposed to run every tuesday at a specific time and export the output in .xls format to a shared location. From the shared location the .xls file gets picked up for further processing and the data is imported into an application and the file is removed from the share. I don’t know if this is the right place to post this query but I couldn’t fine any topic more pertinent. I am experiencing this strange problem in Infoview where recurring instances are getting created itself..For one of the report, there were more than 1000 recurring instances, each getting triggred at the same time, which used up all resources, and all other reports were entering pending state.. I want to know how are the recurring instance getting created itself and/or can I check when was the actual recurring instance created and by whom. Hi KK, I have never heard of such an issue. I wonder if there is some SDK job that could be scheduling those recurring instances. Is it possible to get listing of Document Instance Limits e.g. via Query Builder? I can’t see a way other than by going into each report one at a time. I am pretty new to Business objects, and when I scheduled some reports I did not set the max instances level. Each report was scheduled to run once a day. After two weeks, for some weird reasons I see instances over 200,000 for each file and my BO has become too slow. Please help me out, if you know anything related to this case. Hi Krish, I am not sure where those instances came from, maybe a mistake in seconds and not minutes. You can set the instance limits now and in 24 hours (or less) they will be enforced and your numbers will return to a manageable level. I am facing a weird issue. We have about 800 instances that export the output in .xls format to a shared location. We had an issue with storage space and the cleanup option was selected. Now we need to uncheck the option to ensure that the instance details are captured. However I cannot seem to make that change. On checking the properties in CMC, the option is unchecked, but the instance are still getting cleaned up. The cleanup box is shown as unchecked when you reschedule the recurring instance. Any idea as to why this issue is showing up? Could it be due to auditing being enabled? What is the best method to make sure that the instances do not get cleaned up? Hi Nivin, this is a tough one. Could you just set the number of instances or days to keep at a really high number? Some of my users want to keep 7 days of a daily report instances. I am wondering, what if I set a limits of 7 instances and the report fails 1 time. Will the users be loosing 1 day of successfull report? 1- Report run once creating instance 1 of the report. 3- The other run fails. Question: What is happening with the first instances? then alter the report, and make it fail (break the database, remove the ODBC connection, remove the rights of the user running it, make it run too long, distribute to an invalid email address, the options are infinite! ), schedule it again, and see what happens to the first instance. For one of our report, we have around 4 lakhs plus schedules. I have applied limits on the report and left for 24 hours, to reflect the change. But this did n’t happen. Any ideas!! or is there is any other way, to remove instances, other than SDK. Folks, I have a doubt. How do we delete a report but NOT its schedules, in BO XI 4.0?? Need a solution to this asap. Hi Raghuvar, a schedule is child of a report. Completed scheduled reports are also child instances of the report. You cannot delete the parent report without deleting all of the child schedules and report instances. You can, of course, delete the child instances without impacting the schedule (recurring report instance). Is it possible to RECALL the email, when a report has been scheduled via email option ? Q2) I have 100’s of scheduled reports. From these, how do I check if my scheduled reports have generated partial results or complete results ? Please note that I have a variable in my report that captures this details but want to know if there is any quicker way to find these details within scheduled copies / instances ? Q1) I am 99.9% recalling emails is not possible; however, if you used a dedicated MS Exchange account you could probably log INTO that account and you might be able to do a recall from there, but I am not sure of this. Q2) I don’t think that partial results is anything captured in Query Builder (attached to each instance), but it might be possible. Have you queried an instance there and looked at all of the attributes? Auditing, if enabled, is another option, but again, I can’t recall from the top of my head if partial refresh status is stored there. Thanks Julian for your response on my 2 queries. Further on Q2, would like to inform you that within BO report, we are using BO function to check if the results fetched are Partial or Complete. So, is there any way to check the value that these variables hold ? Accordingly we can decide if the results are partial or not. Hi Foram, unfortunately, there is no way to know the value of any variables outside of opening the report. Its not possible in Query Builder or CMC, as far as I know. Any idea on the max file (xls) size that can be emailed via BO scheduler ? Also, does it vary with the version of Microsoft Office installed on BO server or a given machine from where scheduling happens? Hi Foram, I have never detected a max size; I think the max is related more to how long your session will last before expiring during the file generation. Also, Excel is never installed on the server for this purpose. 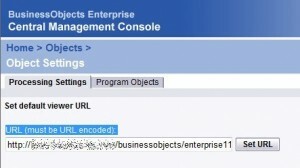 SAP Business Objects handles the Excel file generation in their own code, which they may license from Microsoft. I have admin access in BOXIR2 system. Right now the disk space issue has occurred. And we are deleted some of the test folders which not using currently. How this limit option can help in this context to keep the diskspace in safe zone.? Is it possible to always have a default expiration date for the recurring instances? Sorry, I have never seen such a setting in Business Objects’ CMC settings.. I wish it would default to 6 months or less. I am having issues with some admin not having the ability to right click in the CMC and Infoview. Can Anyone offer advice to fix this?